Editor’s Note: This is a special encore post. It attracted the fourth-most traffic in the first half of the year of any LinkedIn Marketing Blog post that first appeared in 2018. 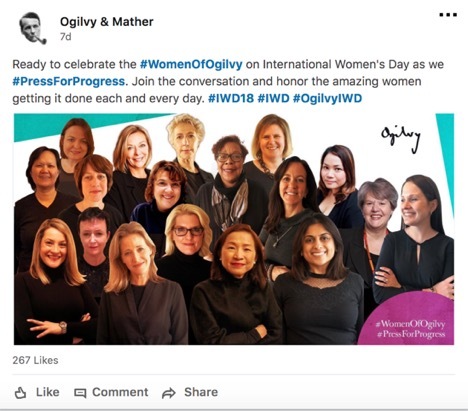 About six years ago, Ogilvy, the global marketing communications agency founded by the legendary David Ogilvy, launched its LinkedIn Company Page. Initially, the Ogilvy Company Page started with no followers. Now, the Ogilvy Company Page on LinkedIn has more than 500,000 followers, most of them procured organically. “It’s our secret weapon,” says Adam Kornblum, Ogilvy’s Worldwide Head of Social Media and Content Distribution. Note that Company Pages are free on LinkedIn. Any company can create them. Content shared on Company Pages appears in the LinkedIn feed of whoever follows the Page. When used skillfully, Company Pages can amass large, relevant followings and become conduits for organizations to share content with their target audience — which can include potential hires, prospects, customers, and partners. With its Company Page, Ogilvy aims its content at its key audiences. “We’re trying to attract talent, and we’re also trying to show our clients and our prospects our intelligence in the marketing space,” Kornblum says. The Company Page is an essential employer branding engine for Ogilvy. “We’re able to attract more talent by personifying and defining the brand,” Kornblum says. 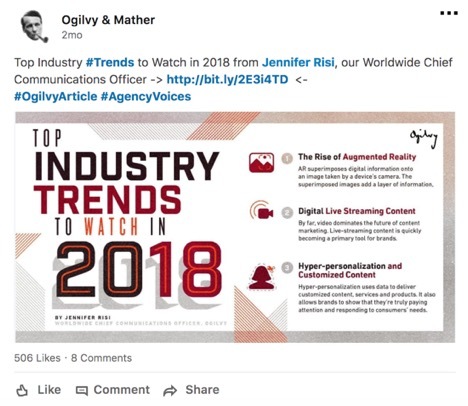 Ogilvy has amassed followings on Facebook, Twitter, and other social media networks. None of the followings are as big as Ogilvy’s LinkedIn following. Kornblum says that LinkedIn is unique because of the expectations of content that the audience interacts with versus other social channels. 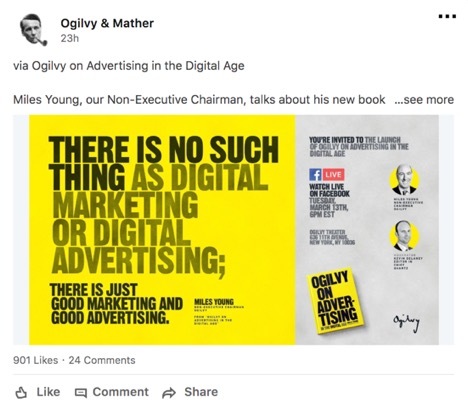 A post highlighting “Ogilvy on Advertising in the Digital Age,” a new book by Ogilvy Non-Executive Chairman Miles Young. 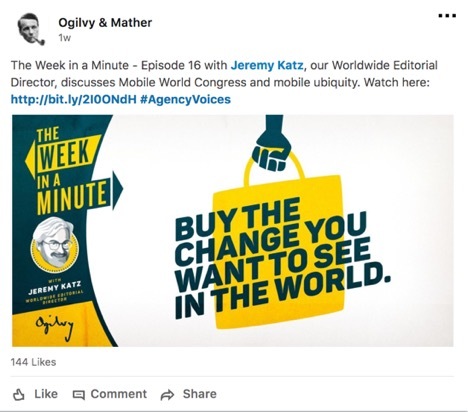 A weekly post featuring Ogilvy’s Jeremy Katz encapsulating the week’s advertising industry news in 60 seconds. A post recognizing International Women’s Day. A post highlighting top industry trends in 2018. Ogilvy’s Company Page also helps with customer marketing. Current clients see the value of Ogilvy’s reach on the network. “Clients frequently ask us to have their work shared on Ogilvy’s social media because it has such strong distribution,” Kornblum said. 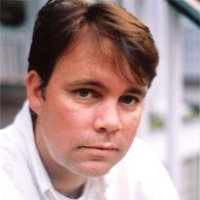 He emphasizes that Ogilvy’s Company Page on LinkedIn is an organic content powerhouse for the agency. “If there’s one thing to understand about the power of our Company Page, it’s that earned engagement is not dead,” Kornblum says. Next goal for Ogilvy’s Company Page: 1 million followers. “Through our Next Chapter plans we expect to see accelerated growth on LinkedIn and our social media presence in general,” Kornblum says. To continue getting the most important marketing tips and tricks to grow your company's social following, subscribe to the LinkedIn Marketing Blog today!